I'm sure this is true for most of us we had this one stuffy or blanket that was with us pretty much all the time. We would go to sleep with it and take it with us on big scary adventures to the Drs. It was just always with us and usually after a couple months it was pretty grimey looking but that didn't matter to us cause it was our favourite thing and we needed it with us. My Security Stuffy was this brown monkey that of course I called monkey cause as a 2 year old I couldn't come up with anything better than that. Monkey went with me everywhere and I loved him He has had holes that have needed repair and he has been washed several times. He even has a missing nose. But he will always be my favourite and surprisingly I still have him today at 25 years old he still sits on my bed and when I need a little comfort I snuggle with him. 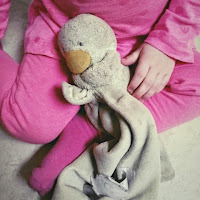 Loves Security Blanket/Stuffy is what she calls Ducky! Ducky is her absolute favourite thing. She talks to Ducky like he knows what she is saying and answers her, she will take him and sit him beside her on the floor or on the front step when we are taking in the nice weather. My biggest fear is that Ducky will one day be missing like he has many times but that we will not find him. I have a backup ducky in case this happens but unfortunately the company who makes ducky changed there design and now ducky looks similar but instead of being all yellow he is yellow holding a white blanket. first of all while the heck would you change the blanket to white white is the hardest thing to clean! obviously the person making the changes doesn't have kids or doesn't have one who is totally and absolutely in love with this toy. So my hope at this point is that I don't ever have to replace Ducky with Ducky 2 cause she is totally going to know or that if I do have to replace him I can find the same one on eBay or something. So here is hoping that Ducky sticks around for a long time and that she grows out of needing him in a few years. The hardest part with Ducky is having to wash him so I have to plan how to get him away from her for him to go in the wash as he is So very much needing a bath right now. I may try and see if she will put him in the washing machine herself to let him go for his bath. Fingers crossed it works!